When traveling, especially backpacking or packing light, there are times when there’s not a nice fresh towel around where you’re staying. Or, on the beach for that matter. Travel towels are amazing for this, as they’re quite small, light, and dry very quickly. When getting a towel, pay attention to get one that’s really absorbent. 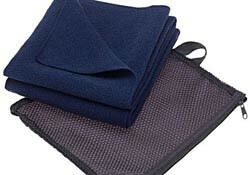 Microfibre and soft-fibre towels from manufacturers like Aquis or Lifeventure are good for thise. Also, many travel towels are anti-bacterially treated. Which is great if you’re not able to wash and dry the towel quite as fastidiously as you’d like. Note that the anti-bacterial treatment will wear out after 40 washes or so. These travel towels are fairly cheap, and apart from the anti-bacterial treatments that may wear out, will last you for a good many years. Last updated by jack on 02 March, 2009 in Travel Gear.